Disclosure: This is not a sponsored posts. I was sent a GB Pock It for an honest review. All words and opinions are 100% our own. 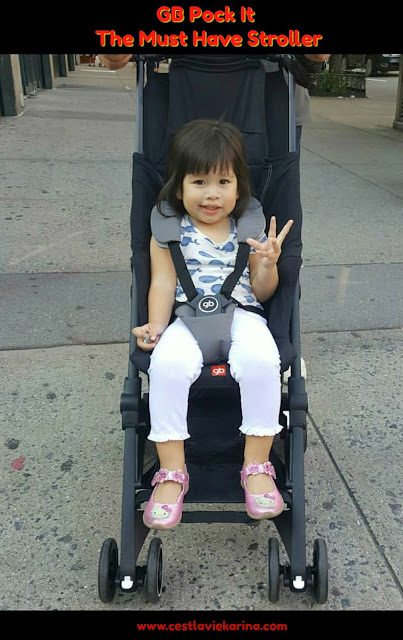 Living in the city can get a little bit exhausting and hectic when you have to carry around your little one and a stroller, especially if you live on the fourth floor like we do. My husband is not always around to be able to help me carry down Valentina and the stroller and it's not safe to leave baby girl alone while I run downstairs to leave the stroller and then run up to get her. 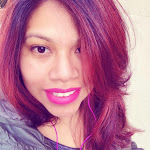 That's why a few months ago when I stopped by the New York Baby Show and saw the GB Pock It in person and in action, I knew it was a must have and it ended up on My Top 3 Picks from the baby show. Then came the fun part being able to try it out for a few months for ourselves. Before I start the review, let me show you just how compact it is and perfect for city life, especially when living in an apartment. That's the stroller tucked away in a corner of one of the bedrooms. That's how it looks when it's folded. Seriously, tiny and perfect for storing in tiny spaces. We've had the GB Pock It for a few months now, that means that we can give you an honest review. After using it for what seems like non-stop it is still holding up pretty good. It has made life that much easier and it's been a game changer for sure. It's easy to maneuver around, except for the first few times that you get to use it. It was a little bit hard to steer to the left or right the first few times because it felt a little bit stiff, after that it was easy and definitely perfect for steering around the busy city streets. Folds up nice and compact making it easy to run after cabs or buses, lol. No, seriously it folds up nicely and can be carried by the handlebar easily while you hold your child's hand with the other hand. Perfect for younger siblings to help you push younger sibling around. Valentina loves the GB Pock It and that she can push it around herself. Even though the stroller is small it has a nice storage basket. 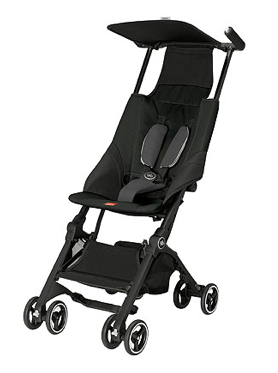 It doesn't recline back like other umbrella strollers, but I'm not sure if this should be a con because even though it doesn't recline, the way the stroller is made the seat has the child in a cradle like position and when he or she falls asleep they end up cradled and they are not slouching forward which means no neck pain. Valentina has fallen asleep in the GB Pock It a few times and she's been ok. So this might be a con or a pro, depends on the parents preference. The umbrella part of the GB Pock It is the only really disappointing part, it doesn't cover the child entirely unless they are really tiny or the sun is not hitting them directly. Other then that they will not be sun covered, so make sure to carry around that sunscreen and a little towel that you can clip on to help. 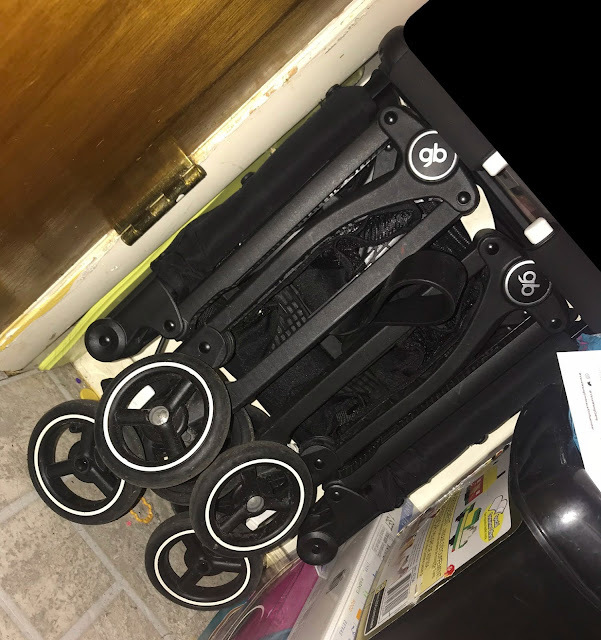 Right now the GB Pock It is the smallest stroller around, it is perfect for traveling with little ones and it is easily stored. For a retail price of about $249 it is really worth the investment. Especially when it is parent and kid approved! But don't take my word for it, makes sure to stop by your local Toys'R'Us or baby store where strollers are sold and check it out for yourself. Oh and make sure to follow them on social media Twitter, Facebook, and Youtube so you don't miss out on product news.